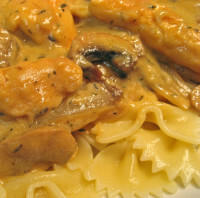 Chicken breast, cut up and quickly cooked, makes a very tender meat for the Stroganoff. You may never go back to the traditional beef! I stray from tradition again, using Greek yogurt rather than the sour cream. Greek yogurt is thicker and creamier than regular plain yogurt, but lower in fat and calories than sour cream. Mon mari prefers not to eat pasta (easier to regulate his blood sugar with potatoes) and, when he does decide to eat pasta, he prefers spaghetti or fettuccine. During the week he has potatoes along side his meat and vegetable. I either eat potatoes, make myself pasta or barley or skip a starch completely. Sunday has always been the day for my food. Sunday is the day I make soups or pastas or risottos and may or may not make a vegetable. Or, if I make a vegetable, it might be lentils or beans. With the exception of the risotto, mon mari will happily pass on everything else. I only make all my favorite comfort foods in winter… Mon mari does the summer cooking; then we eat his favorites on Sunday. Brush any dirt off the mushroom and slice – trimming off the tough stem ends. Put flour and paprika into a medium food bag – large enough to easily hold the chicken. Heat remaining 1 tbs oil in same skillet. Add chicken and sauté until golden, 3 – 4 minutes. Add chicken stock, onions, mushrooms, thyme and mustard to skillet, cover and simmer 5 – 7 minutes. Well….. It seems like this is my week to be irritated, amazed and confounded. Don’t modern cooks know what they’re really for? Why would I want to eat my soup, salad, cake, or the ever-present ‘Mac and Cheese’ out of a Mason jar? Why would I want to drink my morning coffee, afternoon smoothie or evening wine out of a Mason jar? To the best of my knowledge, food put in Mason jars does not taste any better than food not put in Mason jars. I have pretty soup bowls, fun salad plates, lovely dessert plates, beautiful wine glasses….. Why would I want to eat out of a utilitarian Mason jar? Besides, it’s not easy to eat out of a jar. When I make pickles I use a Mason jar. But even then I serve them on a pickle plate. I just saw a recipe for Bacon and Chocolate Chip Cookies. I love bacon, but it doesn’t need to, nor should it be added to every food I eat. Is nothing sacred? Chocolate Chip Cookies? Bacon Brownies? Bacon is high in fat and calories. Think about it people…. Do you really need to put bacon in your donuts? 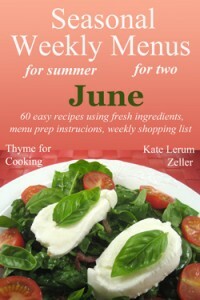 Finally – I received an email the other day promoting ‘Progresso Recipe Starters’. For all of the people who wouldn’t dirty a saucepan with Campbell’s Cream of Mushroom Soup, now there is Progresso Mushroom Cooking Sauce. Obviously, a newer, better, healthier, upscale, gourmet option. The promotion was specifically geared towards ‘busy moms’ so I wasn’t eligible. So I’m wondering…… Will these busy moms be smothering their local, organic, grass-fed beef raised in a healthy environment with a can of Progresso Cheese Cooking Sauce? I believe I’m done now. Thank you for your understanding. Pinterest is full of cocktails in mason jars – I think it weird – nothing like a glamorous long stemmed glass to sip from over a double lipped clumsy jar – to my mind anyway !! I’m with you about the mason jars. Not only utilitarian, but also thick glass, which is sloppy to drink from. So much nicer to sip from a thin, delicate glass. I do like flowers arranged in mason jars but, please, not the food. Bacon. Well, bacon is just one of those things that nearly everyone loves. We are hard wired to like salty and fatty foods, so bacon is in our genes. Still, we don’t have to have it in and with everything. To me, it’s like cake – something to enjoy rarely. How ya doing ‘Kuyat’? Miss you too – must figure out a way to meet up sometime. Zoomie, flowers, yes; wine, no. I love bacon, but, like you, it’s a treat, not a staple. I spent $185 on ONE Waterford stemmed wine glass to drink my wine from. Why in heaven’s name would I want to drink it from a 50cent mason jar? I’ll use them to store stuff, but I won’t eat out of them. And I LOVE bacon! But I want my chocolate chip cookies, just like my bacon, pure and unadulterated. Leave them separate, please! nightsmusic, we bought nice wine glass from an ex-Waterford artisan when we lived in Ireland… just as pretty but not quite as pricey. I enjoy my wine out of them also! It’s all part of the pleasure. Yes, they will. And they will serve their Progresso sauced beef in mason jars. I don’t even like using mason jars for canning. I prefer the kind of jars that don’t have necks (who can get that last bit of preserves from under the lip at the top of the jar?? But, I have to admit that I love to drink wine out of jelly jars – but only if we’re dining outdoors. Which seems to be very very unlikely in the near or distant future (It snowed AGAIN yesterday) so you can rest easy in the knowledge that we are drinking wine out of our crystal stemmed glasses and serving our Stroganoff on plates or wide shallow soup bowls. No plastic, paper or styrofoam, thank you. I don’t really get the Mason jar thing either. I don’t get the bacon thing. Nor do I understand fried eggs on top of food. As for Progresso, I tried a few products years ago and found them lacking. So, rant on, Katie! Elizabeth, and it should be a Spanish rosado out of the jelly jars….